Church members at The Grove Presbyterian Church are randomly paired and commit to monthly meetings as a way to deepen connections between them. With the same spirit of daring that led them to reinvent their once-dying church, members of The Grove Presbyterian Church in Charlotte, North Carolina, are embracing an experiment in fellowship, one relationship at a time. Leadership Education at Duke Divinity recognizes institutions that act creatively in the face of challenges while remaining faithful to their mission and convictions. Winners receive $10,000 to continue their work. Inspired by the Christian directive to go out in pairs, the church launched the Kuhnekt Initiative in June 2016. The Grove formed twosomes by picking the names of church members out of a bowl. If husbands and wives were paired by chance, their names were thrown back in and matched with someone new. Each pair was then given simple instructions: At least once a month, share a conversation -- a meal, an outing, a walk in the park. Discuss your answers to a series of question prompts -- What’s your deepest hope? What’s God teaching you in your life right now? Learn each other’s life stories -- your joys, your challenges, your hopes, your fears. Preserve your budding friendship with a selfie. The Kuhnekt Initiative took hold quickly. So far, 40 church members have participated, in a Presbyterian Church (U.S.A.) congregation that draws 120 on a good Sunday. 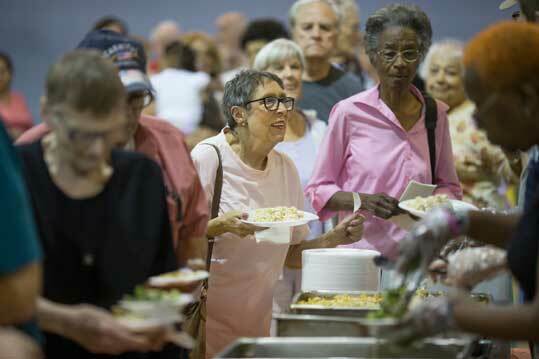 Community meals are part of the church's commitment to opening its doors to all neighbors. Murphy came up with the idea, hoping that by building stronger relationships in the church, The Grove could build stronger relationships beyond the church at a time when Charlotte and so many other communities are divided by race, class, culture and politics. As for the initiative’s name, think connect. Except that church member Rebecca Hart lobbied to use the phonetic spelling to grab our attention. “A little spicier,” she said. For their first Kuhnekt get-together, Octavia Ramsey and Carolyn Cooper drove to Sam’s Club and began to get to know each other, discovering differences as well as similarities. 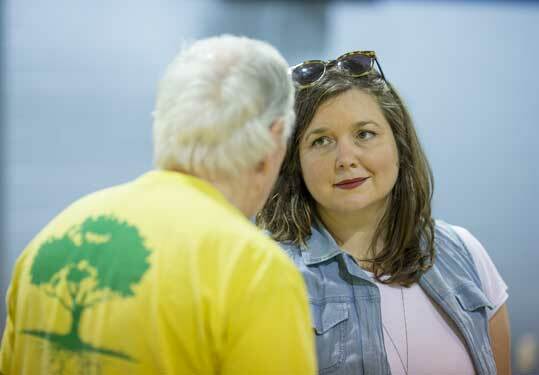 “I think you can serve better when you know people you’re serving with,” Ramsey said. Often we overcomplicate relationship-building. Since everyone needs groceries, why not shop with someone? What else might we do in pairs? 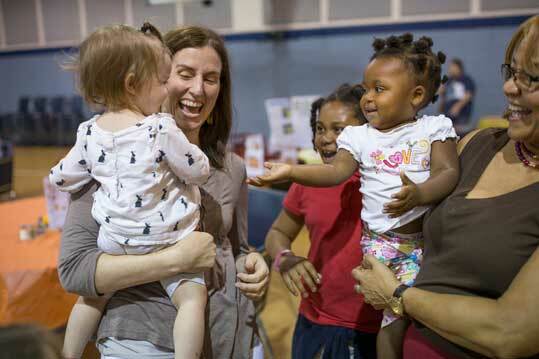 On a recent evening, they gathered with Murphy and others in the church gym for The Grove’s monthly community meal, surrounded by a mix of people: black, white, church members and neighbors of all ages. Outside, a group of young Hispanic men played a pickup game of soccer on the church athletic field. The Rev. Kate Murphy at a community dinner. 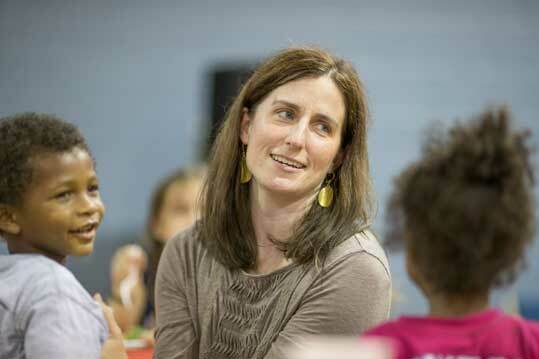 Murphy, 42, came to The Grove with an interest in urban ministry that was honed in Boston, where she earned master of divinity and master of sacred theology degrees from Boston University, then served as associate pastor at Fourth Presbyterian, a multicultural church in South Boston. As The Grove’s experiment in fellowship continues to grow, it is gaining attention beyond Charlotte. The Rev. 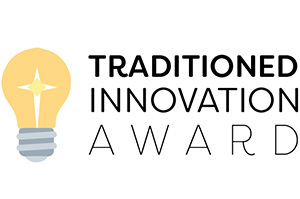 Laura Everett, the executive director of the Massachusetts Council of Churches in Boston, nominated the Kuhnekt Initiative for Leadership Education at Duke Divinity’s Traditioned Innovation Award. Having known Murphy for a dozen years through a Protestant clergy group, Everett has long been struck by Murphy’s vision. The Rev. Kate Murphy's 16-month old daughter Kerry reaches for 18-month old Charlee Rose, being held by her grandmother, Rose Blackmon. But before The Grove could transform the surrounding community through the Kuhnekt Initiative, it had to transform itself. Founded in 1957, Hickory Grove Presbyterian Church thrived for years in a town with deep Presbyterian roots. What would become the city of Charlotte was settled in the 1750s by Scotch-Irish Presbyterians, who built the area’s first seven churches. Hickory Grove Presbyterian reached its peak in the early 1970s, Murphy said, drawing 300 or so worshippers each Sunday and effectively connecting with the largely white community it served. But as the east Charlotte neighborhood around busy W.T. Harris Boulevard grew more culturally and racially diverse, Hickory Grove Presbyterian’s numbers and community ties began to wither. The “change or die” ultimatum offered space for life-giving creativity for The Grove. Are there changes your church can make now to avoid getting to this point? During the yearlong project, pastors of the 10 churches met with outside consultants and read several books on leadership. Lay leaders from each congregation participated in discussions. Finally, consultants crafted a detailed “prescription” for change at each church. Of those 10 churches, one has closed and seven, according to the Charlotte Presbytery, continue to struggle to connect with their communities. At The Grove, the six-page, single-spaced prescription proposed wholesale changes: change the name of the church, the worship time, the worship music, the leadership structure, the bylaws -- and remove the organ from the sanctuary and replace it with video screens. In 2011, the proposal was put up for a vote of the congregation: say yes or no to everything. For the changes to be adopted, two-thirds of the congregation had to vote yes. 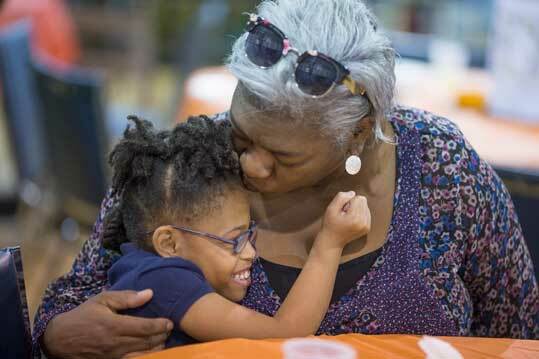 Sherry Terrell hugs her 9-year-old granddaughter Jadein Terrell at the community meal. Exactly two-thirds of the congregation voted for change. Yet by 2012, two-thirds of the original congregation had left, forcing a reduction in Murphy’s hours. The church flourished after a drop in membership. In what ways do numbers fail to tell the whole story in your church? But those who stayed embraced the dramatic change. They renamed the church The Grove, instituted a blend of traditional and contemporary music, and committed to the cause of opening the church doors to all neighbors, regardless of color, culture or class. They launched a host of community-focused initiatives -- the community meal; a community garden, Seeds of Faith, from which members distribute washed and bagged lettuce to neighbors as a gift; a free after-school tutoring program three days a week for grades K-5, nicknamed Firefly; a policy of making athletic fields available to neighbors; and a twist on the traditional church yard sale, called a “yard give,” in which members gather possessions and then give them away to neighbors rather than sell them. Not all the old has been lost; in a nod to their roots, they still sing one traditional hymn each Sunday before the music turns more contemporary. 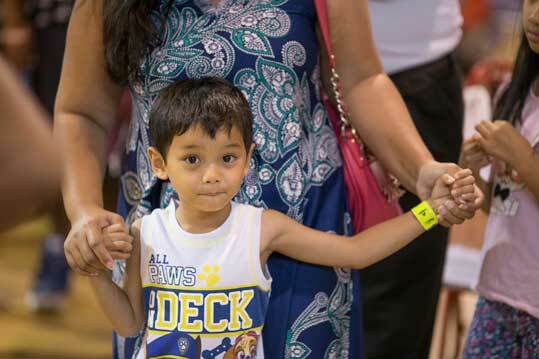 Four-year-old Kayden holds his mother Sophon Chhay's hands at the meal. It has worked. Worship attendance has more than doubled, to 120, with equal proportions of blacks and whites, and several Hispanic families as well. Beyond membership and attendance, the church has embraced a more inclusive spirit, and has been eager to share it. What needs to die in your organization to make space for God’s gifts? Last June, amid a spate of hate crimes nationwide against Muslims, The Grove put up a sign in its front yard, declaring in large, colorful letters: “We love our Muslim neighbors.” After seeing the sign, several Muslim women attended worship at The Grove, then helped serve a Maundy Thursday meal to the congregation the following Holy Week. Church member Rebecca Hart visits with a friend at the community dinner. Among those brought together by the Kuhnekt Initiative are Libba Hicks and Sarah Mayer. Hicks, 75, was in high school when she joined the church. Smiling slyly at the memory, she says she appreciated the ratio of boys to girls in the youth group way back when. What might it look like for your church to “be here, together” in your community? Mayer, 19, a sophomore from Davidson College, served as The Grove’s summer intern. Raised in the Church of Christ back home in Wichita, Kansas, she loved hearing Hicks share how The Grove came to be. Over Reuben sandwiches at the Landmark Diner, Hicks was taken by Mayer’s bubbling-over energy. “That energy goes a long way when you’re my age,” she said. Mayer, in turn, was taken by Hicks’s loyalty, and that of her husband, David, to The Grove -- and by the resilience reflected in the church’s journey. As September’s community meal was winding down, Murphy helped fold up tables, carrying the youngest of her three daughters, Kerry, in a sling on her hip. As she said goodbye to friends and neighbors until next time, the pastor invoked this familiar passage from Galatians 3:28 to capture the spirit of the Kuhnekt Initiative: "There is no longer Jew or Greek, there is no longer slave or free, there is no longer male and female; for all of you are one in Christ." Sometimes we aren’t willing to make changes until we are given the “change or die” ultimatum. Yet that ultimatum offered space for life-giving creativity for The Grove. Are there changes your church can make now to avoid getting to this point? It would be natural to see the departure of two-thirds of the congregation as a sign that leadership made the wrong decision. Yet the church flourished in the resulting change. In what ways do numbers fail to tell the whole story in your church?